WSUS is quite powerful in that it can provide us reports containing useful information regarding which Windows machines have which Windows updates applied, allowing us to get a good overview of our environment. 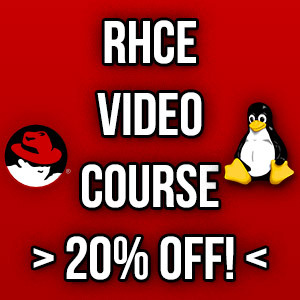 This type of information will be useful if you’re required to perform any type of compliance check to ensure that your servers are properly patched. In this post we’ll take a look at installing the software required to view the reports as well as how to run the reports. In order to view the reports you’ll first need to install some additional features. First open the WSUS console and select Reports from the menu on the left. You should now see various reports that are available. Select any of these reports and you will likely receive the below error. You’ll notice that the error message provides a helpful hyperlink to the following page. Using this link, download the Report Viewer software, close the WSUS console, and attempt to install the software. You may now receive the following new error message, stating that this first requires Microsoft System CLR Types for SQL Server 2012. You can download this here. Select install instructions, then scroll down to the ” Microsoft® System CLR Types for Microsoft® SQL Server® 2012 ” section. Once this has installed, go back and install the Report Viewer. Finally once complete, open the WSUS console back up and go back to the Reports section. You should now be able to successfully view the various reports. In total there are 9 different default reports that can be run from here. 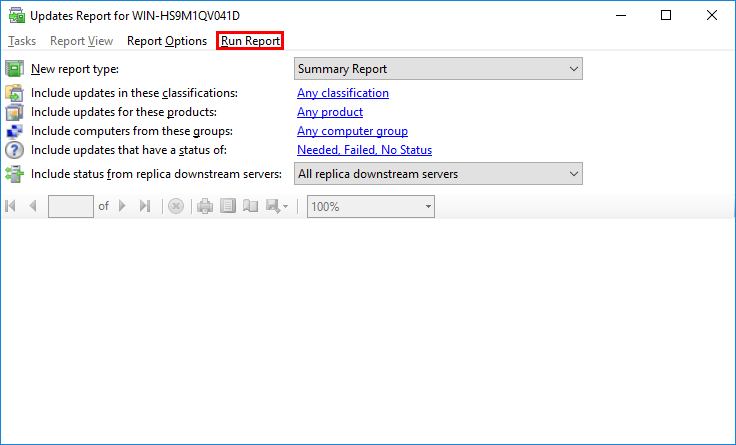 Simply click any of them and filter the type of information that you want in the report such as the types of update classification, product update type, or computer groups for example. Once you’re happy, click the Run Report button to generate the report. Once the report generates, you’ll be presented with a window showing you various information related to the report that you’ve chosen. You can optionally export and save the report as an Excel spreadsheet, PDF, or Word Document. We can give other users access to view and generate reports by putting them into the WSUS reporters group, this is a read only group. 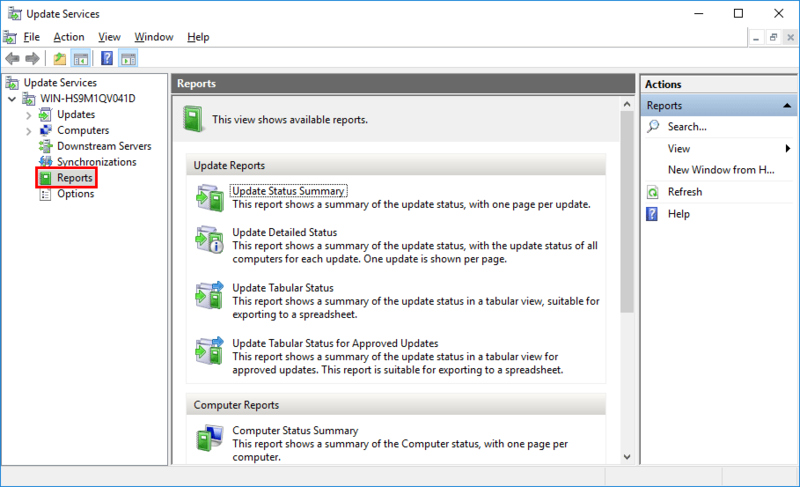 After installing a couple of small pieces of software we can now successfully run and view various useful WSUS reports. 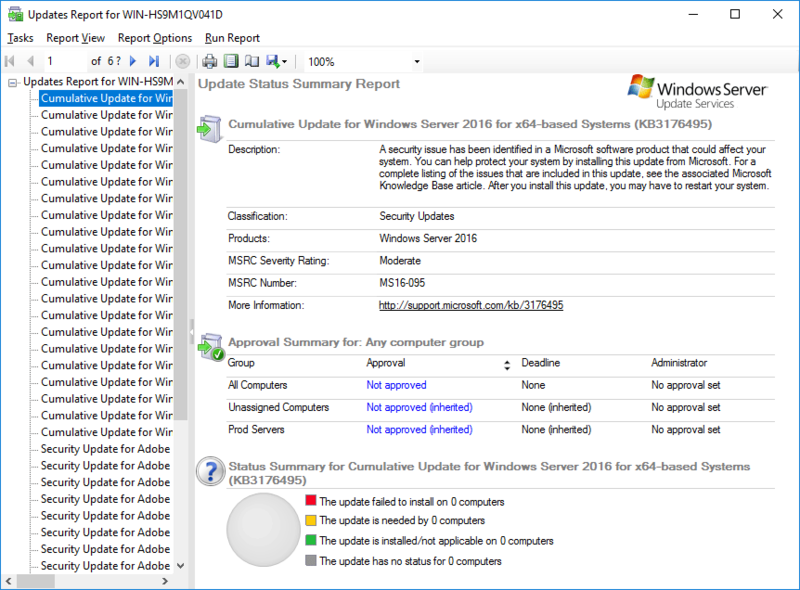 These reports can be used to give us different information regarding the state of deployed updates in our Windows environment. After installing the CLR types and Report viewer I still receive the error “the Microsoft Report viewer 2012 Redistributable is required for this feature”……WSUS is installed on a 2016 Server Core.